... 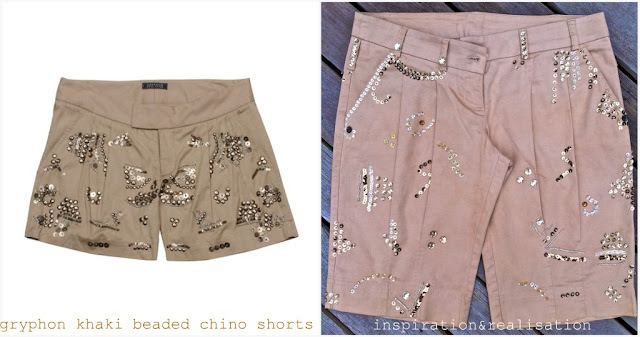 Remember many moons ago when I stained with tea a pair of khaki shorts gone bad? ... Since the tea stain was a success, I decided to give them a "facelift" and this is how they turned out after I started to work on these, but for one reason or another, being left in a corner for almost a month. Yesterday we had a thunderstorm here, and then it was a little too cold and foggy for the beach: perfect day to finish my project! Inspired by a pair of Gryphon shorts, I got my sequins, beads and thread out and started sewing. After being done with the first leg, I wasn't sure if I wanted to make the other leg symmetric or not. Random is a better option, sometimes!! This project is a bit time consuming (about 5 hours total), but hey, a heck of a way to make your khaki shorts look waaaayyyy different! Wow, very cool! Love them! How creative! I love it! So worth all the effort! 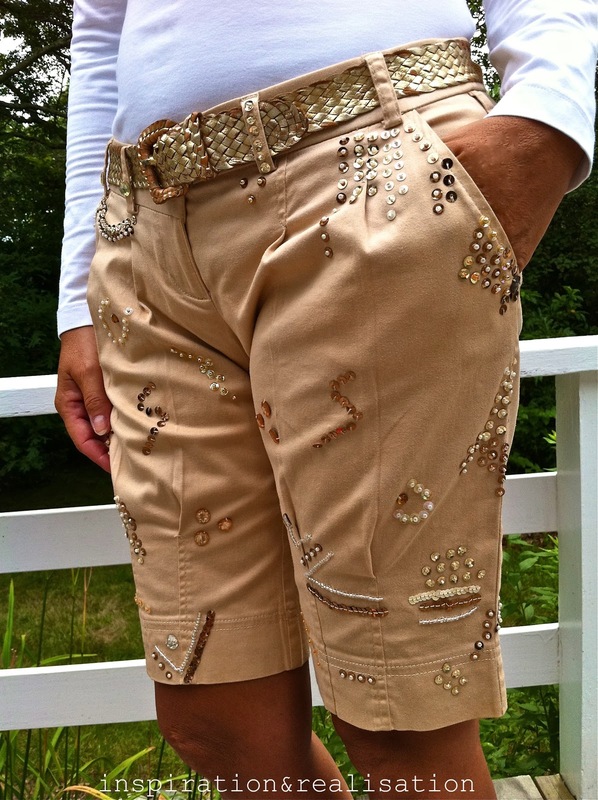 Fabulous shorts! and well worth the 5hrs I'd say! The shorts are so cute and look fun to wear. What a cute idea! I love me some sparkles!! Would love for you to link up at my party HERE if you have time! Have a great Wed! What a creative idea... and a lot of work! And I must agree; if it isn't perfect, random is the way to go! Wonder if i could use fabric glue for the sequins? Love it! I'm going to start beading a belly dance costume soon and will be using sequins and beads as well. I might have to practice on some shorts too! to grey or not to grey?